Visit my other blog, Jess Toye Quilts, today! It is the last day on the blog tour for the book I contributed to called Optical Illusions: Innovative Designs for the Modern Quilter. 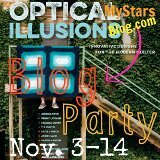 There are prizes up for grabs, so be sure to visit My Stars’ blog party kickoff post for all the details. Hope you stop on over and read a little of what went into my design for the book.